September begins with Labor Day weekend trips to the beach, cooler weather, and excitement for the new season as we say goodbye to Summer and hello to Fall. For many, September is known best for the kick off of football season, a time for tailgates, comradery, and for some, marital stress. The hits to marriage are not only in the living rooms and parking lots of America, but also on the playing field. The reported divorce rate for players of the National Football League is somewhere between 60 and 80 percent. And while this number is higher than the more commonly known average of 50 percent, it is very comparable to other professional athletes. So is football to blame for thousands of American divorces each year? Don’t throw the penalty flag just yet. For both the professional athletes and the fans obsessed with them, it often comes down to one spouse not devoting enough of their time to spend with their spouse and kids. Finding the perfect balance between a demanding job, family life and “me time” is not an easy task to accomplish for anyone, but discovering that symmetry is vital to a healthy marriage. 1. Split time on Sunday afternoon by watching a couple games that the football fanatic is most interested in watching. Then spend the rest of the evening doing a different activity that the other spouse enjoys. 2. Spend one Sunday together watching football, with both spouses actively involved. Then the next weekend, leave the couch and try a new adventure together. 3. Consider buying the not-so-interested spouse a jersey to help him or her feel like they are a part of the team. You can even get personalized ones! 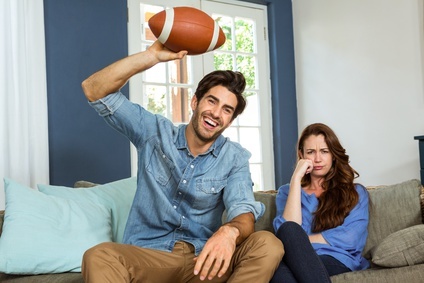 In any of the above scenarios, the football fan needs to take time to explain the game to the inexperienced spouse, and the non-football fan should be open to the experience as well. So while you cheer on your favorite football team this season (Go Panthers! ), remember to spend time nurturing the most important team in life: family.